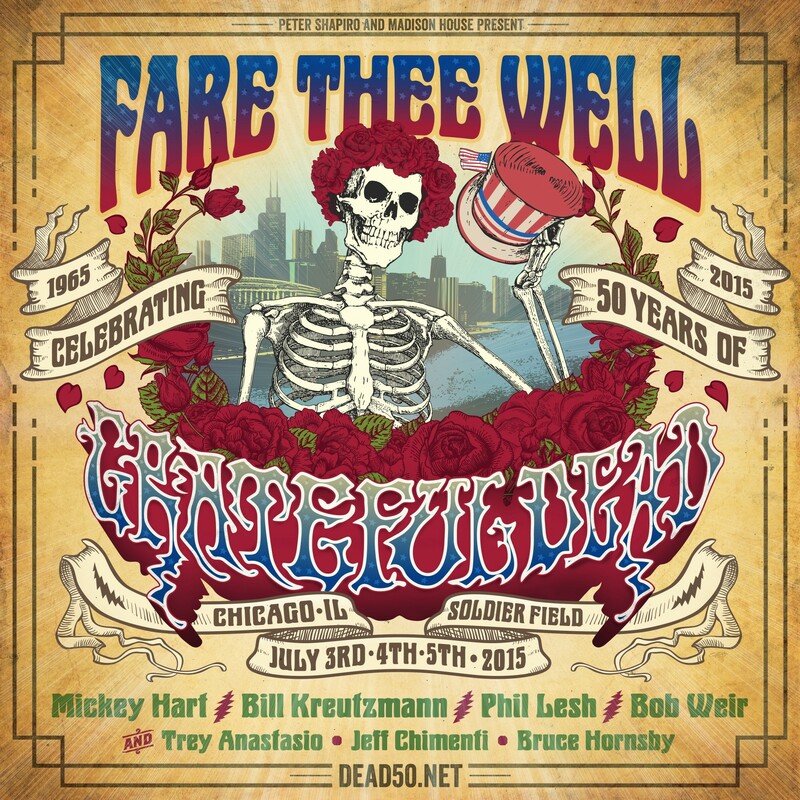 So, last night, at Soldier Field in Chicago, the Grateful Dead played what was billed as their last ever concert, which is to say that the “core four”, the four surviving members of the original band — Bob Weir, Phil Lesh, Bill Kreutzmann, and Mickey Hart — claim they will never again all play together after the run of five shows they just did. I was fortunate enough to be able to watch the show via Pay-Per-View at a friend’s house, it was a very emotional experience, and today I find myself still reeling with feelings. I’ve written numerous times, here at Fish & Bicycles about my longstanding love of the Grateful Dead and my unapologetic identification as a Deadhead. I’ve gone VERY deep with the Dead’s music over many years, and I’m so grateful for all of the fun, inspiration, and meaning it has given me and will continue to give. One of the things that was so special about the Grateful Dead, and which partly explains why I’m so emotional about their grand finale, is that the band members were never rock stars. Instead, they felt almost like friends. After all, they cut their teeth at the Acid Tests, where they thought of themselves as participants in a communal experience, rather than hired musicians up on a bandstand, there to simply entertain the party guests. Eventually, of course, they graduated to larger and larger venues, and were, by necessity, up on a huge stage at a distance from much of the crowd, but they weren’t egomaniacal showmen, prancing and strutting around the stage for attention, as if it was all about them. They simply made music and cared deeply that their shows should be meaningful, exploratory, and uniting experiences. Another thing that contributed to the Grateful Dead’s appeal, especially to aspiring musicians like myself, is that, due to the improvisational approach they took to their music, pushing the envelope every night, exploring new ideas in front of a live audience, not every idea worked, a flub here and flub there, just often enough to remind you that they were human, so that you notice you still love them, warts and all, and they always pulled themselves out of the occasional train wreck, eventually. Again, for an aspiring musician this is a powerful, powerful thing, it’s the thing that encouraged millions of people like me to pick up a guitar, learn some Dead tunes, and to stick with it, in many cases long enough to get good enough to play with other musicians, where the real fun starts. Finally, the last element of Dead appeal derives from their hippie roots. I’ve mentioned my fondness for hippie culture before, and I still long to be surrounded by people who truly believe that love; peaceful, supportive, inclusive community; and freedom of expression are the most important things. Last night, then, was decidedly NOT just another concert. It was a fond farewell, the end of a long, strange trip, it was friends saying goodbye to friends in all directions, it was the band saying goodbye to each other, it was Bob Weir choking up and struggling to get through the lyrics of his song Throwing Stones, and then Phil Lesh doing the same thing on his tune Unbroken Chain, at the realization that this will be the last time they will ever sing those songs with their bandmates of 50 years, it was the conspicuous and painful absence of Jerry Garcia who had been the heart and soul of the Dead, and it was the reverent, loving tribute that Trey Anastasio paid to Jerry, filling his shoes as best as he could, emulating some of Jerry’s classic tones, riffs, and licks, while bringing his own touches and voice, just as Jerry would have wanted him to do. The show ended with one of the band’s more obscure songs, Attics Of My Life, a haunting hymn from their classic 1970 album American Beauty, a song about the power of music, and about how music is even more powerful when partnered with love and shared. Here, then, is that performance, which, even with crappy sound quality, moves me deeply once again. And, just to make up for the crappy sound quality, I’ve included the original studio recording, so that those not familiar with the song can hear more clearly the sublime beauty and lovely harmonies.